Finding a quality watch with obvious craftsmanship, but subtle luxury, can be a difficult undertaking. Tag Heuer takes pride in their reputation for well-made, high quality timepieces that are precise enough to time international sporting events around the world. That reputation has evolved to include visually appealing watches with fine materials and subtle details. 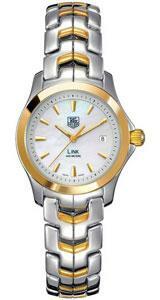 Tag Heuer’s Link WJF1352.BB0581 ladies watch is a great example of delicate luxury. Mother of Pearl serves as the background for time, covering the entire face and not simply a smaller center circle, as is often done when featuring Mother of Pearl. Set onto the iridescent face are eleven gold-toned batons to mark the hours. The missing baton at three o’clock is replaced with the small date display. Three golden hands extend from the center; luminous hour and minute hands allow time to be clearly read in the dark and beneath the water. Moving outward from the watch face is a ring of simple, black-marked minutes and then the smooth, gold bezel. This bezel is primarily for function with no extraneous design to get in the way. Brilliant gold is all that is necessary to make the entire 27mm case truly shine. The bezel is unidirectional to prevent accidental movement from increasing time within designated time limits. The band of Tag Heuer’s Link WJF1352.BB0581 is made of stunning S-Links, which not only look incredible but are smooth and comfortable against the wrist. To keep from accidental opening, Tag Heuer also features a security clasp that will only open when you want it opened. Included standard with Tag Heuer’s watches is a sapphire crystal that is scratch resistant, and the ability to swim, dive or snorkel with your watch to a depth of 200 meters or 660 feet. The combination of stainless steel and 18 karat gold prove to be a versatile choice and create a piece with the ability to complement both gold and silver jewelery. The price is good, retailing at $2,500 US dollars, with Amazon providing a smashing deal at $1,620 and a 2 year warranty. The size is good too, as it is slightly smaller in diameter and a great size for peteite wrists, while remaining noticeable. What many users loved most about the Link WJF1352.BB0581 was that it was not overly flashy, but rather a subdued use of truly beautiful materials. Other Link variations (CJF1314.BA0580, WJF1354.BB0581) contain more diamonds if less flashy is a drawback to you. If you’re looking for a comfortable, subtle watch to wear for any occasion Tag Heuer’s Link is the place start and end your search. My wife lost her WJF1352 watch. We ordered a used one on the Chronos24 site. When she received it wouldn’t fit. she needs another 2 or 3 links. Can you help us? Thanks.